Find information on The Tudors and Tudor History, events like the Wars of the Roses and the Protestant Reformation and famous figures such as Henry VIII, Henry VIII's wives, Queen Mary, Queen Elizabeth I, Mary Queen of Scots and more. An exhibition about Mary Queen of Scots is currently being hosted at the National Museum of Scotland in Edinburgh and will run until the 17th November. I just wanted to share with you this wonderful virtual sculpture of Mary that was created for the exhibition by a team of experts from the University of Dundee, it’s amazing what can be achieved with technology these days! 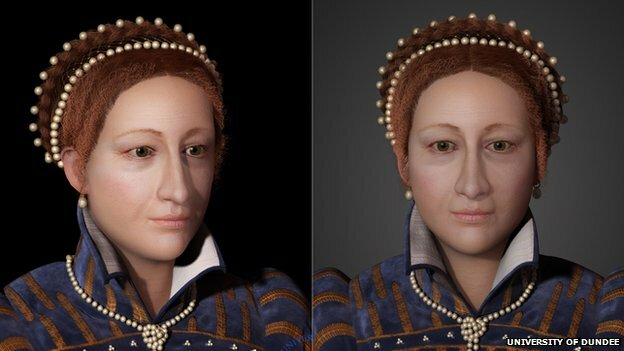 It shows what Mary may have looked like during her reign in Scotland when she was between 19 and 26 years old and was created using 3D modelling software and craniofacial templates. Unfortunately no portraits have survived from Mary’s time in Scotland so experts had to use what they could from before and after this period to create the model. Professor Wilkinson who was part of team described Mary as having quite a large nose and chin but points out that these strong features coupled with her pale skin and red hair gave her a very striking appearance. I would have to agree, what do you think? 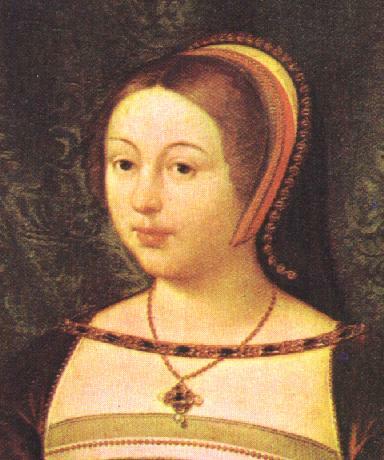 Today in 1514 Margaret Tudor, the older sister of Henry VIII and widow of James IV of Scotland, married Archibald Douglas, 6th Earl of Angus, which forced her to give up her Regency in Scotland. Margaret’s intriguing story is very much intertwined with Scottish politics and is explored further in this article. Margaret, like all daughters of monarchs, had been a political pawn for her father Henry VII and her first marriage to James IV, which happened by proxy on 25th January 1502 and in person on 8th August 1503, was made in an effort to end Scottish support for the pretender Perkin Warbeck. Scotland at this time was an enemy of England and an ancient supporter of France in what had become known as the Auld Alliance so this marriage was a real diplomatic coup for Henry VII. A treaty of perpetual peace had been agreed between England and Scotland on 24th January the previous year with the marriage a guarantee of this peace. It was the first peace treaty between the two countries for 170 years but sadly it didn’t last long after the death of Henry VII in 1509. Following on from my post on ‘The Last Days of Anne Boleyn’ I thought it would be useful to suggest some further reading for anyone interested in finding out more about Anne. Eric Ives brilliant book is seen by many as the definitive biography on Anne Boleyn. Expertly researched as you would expect from the leading expert on Anne it is a fascinating read and definitely one for the collection. Eric was a real Anne supporter and was very much of the view that Cromwell was responsible for her downfall. In the book he explores all the evidence in detail and makes a compelling argument in favour of this theory. Ives book is so much more than just an account of Anne’s downfall, it also provides detail on her early life, courtship with Henry and involvement in religion and politics. We don’t have much evidence on Anne ‘the person’ or her early years but Ives painstakingly put’s together everything we do have to paint a full and detailed account of her life.